In the era of social media and smartphones, occupational therapy websites are abundant! Connecting with other occupational therapists from a wide variety of practice areas, settings, backgrounds, and cultural contexts has never been easier. With the touch of a few buttons on your tablet or iPhone, you can travel to a world of excellent information about our occupational therapy profession across a plethora of platforms. 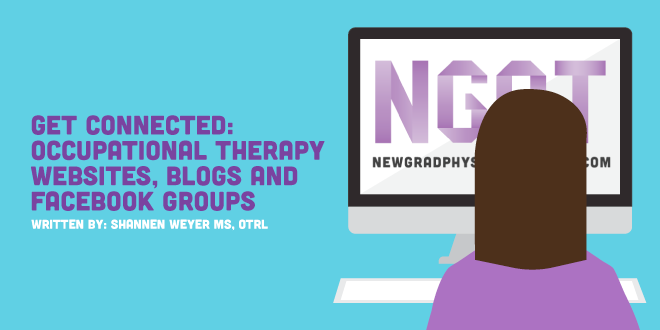 Occupational therapy websites and blogs enable readers to see through the OT lens on an array of diverse subject matter. OT bloggers may recount on personal testimonies or may allude to specific memories such as the feeling of securing one’s first job or a narrative post about a touching moment with a previous patient (without violating HIPAA, of course) through their writing. Mandy Chamberlain MOTR/L is the creator of Seniors Flourish. She helps other occupational therapy practitioners who work with the geriatric population through education, tips, resources, video podcasts, journal club and her learning lab. Her inspiration to help others achieve practical solutions to life’s problems comes from her late grandfather. Alexis Joelle OTR/L is an occupational therapist who prides herself on being an OT wellness consultant/client advocate. She has a passion for connecting online with other OT practitioners and students that she calls her #OTTribe. She hosts an online seminar for those preparing for the NBCOT. As she openly admits and posts about her experience of not passing the exam the first time, she’s an excellent go to. Christie Kiley, MA, OTR/L is a pediatric OT and creator of Mama OT blog. Her blog posts range from experiences about raising her own children to educational and fun posts about the developmental sequence of kiddos and insightful age-appropriate intervention ideas. Mama OT is always referencing and recommending resources for both new grads and seasoned practitioners. Founded by Shelley Galvin OTR/L, C/NDT and Patricia Pooler MS, OTR/L, Tools to Grow provides a one-stop shop for valuable resources and tools in a very user-friendly manner to pediatric occupational therapists, special needs therapists, and caregivers in the pediatric settings. Bonus! Signing up for this website blog gives access to over 2,500 therapy resources. Casey Sumner, OTR/L is the face behind this resourceful and encouraging blog. She utilizes longer narrative posts in combination with multiple pictures to give her readers a visual of her pediatrics based frame of mind. Her blog offers various free printables! Nicolette Spaccavento, OTS is a new blogger expressing her experiences as an occupational therapy student. Her previous posts articulate her definition of our valued profession, promote learning and growing through fieldwork, and describe how she prepped for AOTA’s Centennial Celebration. Created by me (Shannen) while I was still an occupational therapy student, the idea behind my blog was to increase awareness, promote understanding, and advocate for occupational therapy as well as my fiance’s profession (osteopathic medicine) with the intention to mOTivate all types (since the goals these days is collaborative care) of healthcare professionals and students on their journey. Jane Ina Fforde, OTS is a student, writer, mom, traveler, and former teacher who reflects on her own occupational balance through the content from her blog. She writes with great passion and has a special interest in advocating for mental health and wellbeing. This Facebook group is the mother of them all with almost 15,000 members and counting. Within this group are over 25 subgroups that you can join based on your interest area. Here is a preview subgroup list of what to search for in the Facebook toolbar. If you believe there should be an OT online group and it has not been created you can contact the OT4OT admin to get it started! If you’re currently an OT/OTA student or have recently graduated and your turn to tackle the NBCOT is creeping closer and closer, following this group will be an invaluable asset. This group was created to connect other students and entry-level practitioners in their journey to pass the most important test of our career. Members share tips on passing the exam, motivational quotes, boards study calendars, application and licensure information, discussions about clinical scenarios, and more. Created to unite OT/PT/SLPs together who work with the geriatric population in varied settings (long-term care, skilled nursing, home health, outpatient, hospitals), this group provides intervention ideas, enables entry level therapists in asking seasoned therapists clinical reasoning questions, and promotes working collaboratively with other disciplines to provide the best patient care. With 25,000 members and counting, if you’re a peds OT practitioner or an OT student with aspirations to work with little kiddos this is the Facebook page for you! You will find posts on intervention ideas, pictures of sensory equipment, recommended peds continuing education courses, and much more. Sarah Stromsdorfer is an occupational therapist who started this relatively new group to facilitate an online OT community filled with connections, tips, inspiration, answers to questions, and practical advice in addition to tidbits of self-care opportunities such as the ability to share with the group on “Feel Good Friday” for example. Let’s face it. You MUST be subscribed to the OT Mothership. What better way to get inspired than by reliving keynote sessions from our centennial conference or listening to a podcast on an up and coming evidence-based OT intervention. Subscribe and don’t be surprised when you find yourself accidentally singing an OT song from one of the videos. Nya Caudell, COTA/L is a certified occupational therapy assistant who uses her youtube channel to discuss everything OT related. From videos demonstrating Manual Muscle Tests to explaining an Individualized Education Plan (IEP) to expressing her understanding of the Model of Human Model (MOHO), Nya does a great job to show activities through an OT lens.